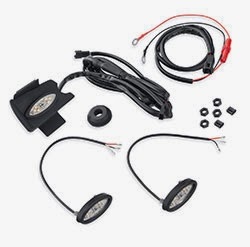 Stop fumbling in the dark with the new Tour-Pak® Luggage and Saddlebag Interior Light Kit (P/N 68000151, $119.95) from Harley-Davidson® Genuine Motor Parts and Accessories. Brilliant white LED lamps illuminate the interior of Tour-Pak and hard saddlebag luggage of 2014 Harley-Davidson Touring models informed by Project RUSHMORE to add convenience for early-morning packing or the late, dark end of a ride. One LED light pod mounts inside the Tour-Pak carrier to illuminate the interior, and two LED light pods mount to the bottom of the Tour-Pak carrier to cast light inside the open saddlebags. Each LED light pod features a soft-touch micro switch for ease of activation, and a five-minute auto shutoff timer to prevent battery drain. The kit fits 2014 Electra Glide® and Street Glide® models equipped with King Tour-Pak luggage.